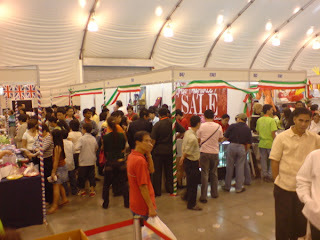 This was the scene at the International Bazaar at PICC last Sunday. SUNDAY was International Bazaar day at the PICC. Fil and I arrived late so we found the venue pretty much filled to the brim, with a long line of patient shoppers still waiting to get in. Bumped into the late Enrique Zobel's right hand Joan Orendain, who looked very slim since I last saw her. She joked that she was wearing a whole pile of girdles underneath her slacks. Hahaha...but owww! Joan was handling the publicity for the International Bazaar Foundation chaired by Lovely Romulo, spouse to Foreign Affairs Secretary Alberto Romulo, who, we heard, also arrived at the bazaar. She said media entrance was free but Fil and I had decided to each pay our P100 tickets considering the event was for charity. Btw, Joan is responsible for a number of books in my library as she loved to gift them to editors. We may have had our differences in the past but as you get older, you somehow learn to let go of a lot of old hurts and irritations. Inside, we met the Romulo children, Mons Tantoco, a columnist for Phil. 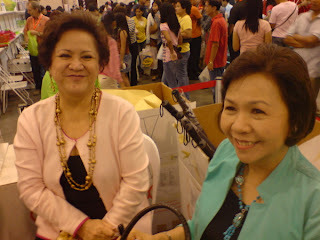 Star, and Lupe Romulo, whom I knew because we both worked for Manila Standard under Jullie Yap Daza. Lupe said she had been away from the country for awhile and probably had about five years worth of columns to write. But she said she no longer has a taste for society writing, and I joked that maybe it's for the best, otherwise baka ma-Malu Fernandez pa sya! Of course, Lupe is not the insensitive sort like that ex-People Asia columnist. Also filling her shopping basket to the brim was Tita Moonyeen Singson, the spritely wife of former Bangko Sentral ng Pilipinas Gov. Gabriel (aka "Lolo Gabby") Singson. Tita Moonyeen surely has endured a lot of trials in her life, and so Fil and I were glad that she looked so happy and healthy. She has such a joyful spirit that is so infectious, I cannot help but admire this woman. Escorting Tita Moonyeen, was Alice Favila, also a member of the International Bazaar Foundation and wife to Trade and Industry Secretary Peter Favila. For those who were also at the bazaar on Sunday, Alice was the voice announcing raffle winners. Unfortunately for Fil and I, no amount of cajoling Alice could make her call out our names. Not far behind the Tita Moonyeen-Alice parade was a dressed-down Antonio Abacan, president of Metrobank whom I thought did a good job guarding the bank's onsite ATM and filling it up with lotsa cash hehehe! Geez, there sure were a lot of shoppers withdrawing that day! Unfortunately, I wasn't able to buy a lot of goodies from the international embassies which had their booths that day. Aside from the throng of people which made it almost impossible to move through the corridors, the prices were outrageously expensive for some items. Like there was a nice embroidered blouse being sold at the Thai embassy booth which the sales clerks said was P1,200. Also there was a beautiful necklace of gems selling for P14,000. You and I have been to Bangkok. You know exactly how much these things cost especially if you go to their Divisoria-like areas. I quipped to a fellow shopper that it was probably cheaper to fly to Bangkok and buy the stuff there than at the booth, to which she answered "Korek!" At the Spanish embassy booth, there were also the usual baby colognes...but selling at least P50 more than what they go for at the Watson in SM. And the can of fabada which my mom and I only bought at Landmark grocery at Trinoma the day before, cost P120. At Landmark it was only P111. Same deal with the olives, olive oil, and other food stuff, Too bad there were no espadrilles being sold – last year they were a real steal at P250 a pair. The wines at the New Zealand booth were also ridiculously expensive...selling for the same prices at Santi's! I love NZ wines (Villa Maria Estate's pinot noirs are especially excellent, and its sauvignon blancs are constant awardees in international wine competitions) but I was there to shop for bargains not support the entire government of PM Helen Clark! The only inexpensive wine I found was at the Chilean embassy booth, about P420, although it wasn't the year and the variety I was looking for. What I wanted to buy at the NZ embassy was lamb chops but due to our late arrival, were already all gone. Darn. 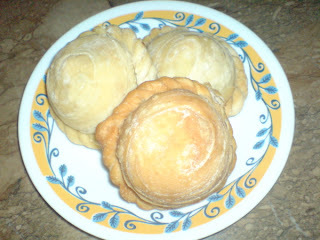 Yummy empanada from Polland bakery. And yes, the U.S. Embassy was absent again this year, although Fil quipped it was probably because there was really no more "made in the USA" goods to speak of. I guess it's also because every month, the American Women's Bazaar is held at the World Trade Center, although I've been there a few times and have not seen many US goods/brands either. Geez, and to think California 2006 wines are especially superb this year and although I'm not a steak person, their certified Angus beef is still tops in my book. But duh, what were "made in the Philippines" goods doing in the Korean booth?! You would think they would sell their beautiful leather bags and or at least DVDs of their hugely popular telenovelas! Buti pa ang Cuban embassy had CDs of their music on sale (pirated lang nga), and cigars. Of course since I don't smoke I didn't look at the boxes of Havanas on display. 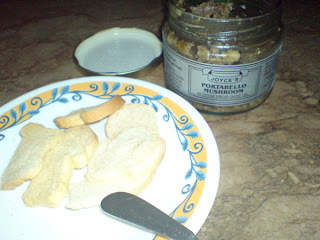 Joyce's portabello mushroom dip in extra virgin olive oil with melba toast on the side. Fab dish for cocktails. As usual, it was mostly food I brought home, infused with the local flavor and sweat of our fellow Pinoys, like the really delicious empanada of Polland bakery, the homemade Portabello mushroom dip of Joyce Aragon, some hummus from good old reliable Kashmir restaurant with some pita bread and an order of plain roti. Yummm. I was also able to buy my pantulog – a pair of cotton shorts and top, and a night dress, for P200 each. There was also a long kurta-like gown from Turkey for P750 which I plan to shorten and hem in time for next summer's bathing suit season. (The bleached blonde tindera, however, was really kinda sungit though and absolutely refused to give me a discount for the box of baklavas she was selling for P800.) 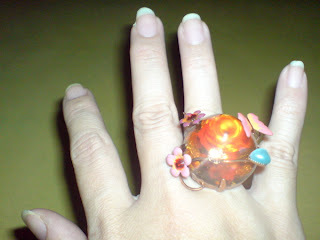 I also love my new weird ring which I bought for P250 from one of the charity organizations selling their wares at the bazaar. Thanks to Lupe for clueing me in on it, after I saw the cute thing on her finger.